When I first saw this photo on Facebook, I thought it might be a hoax. It's not. 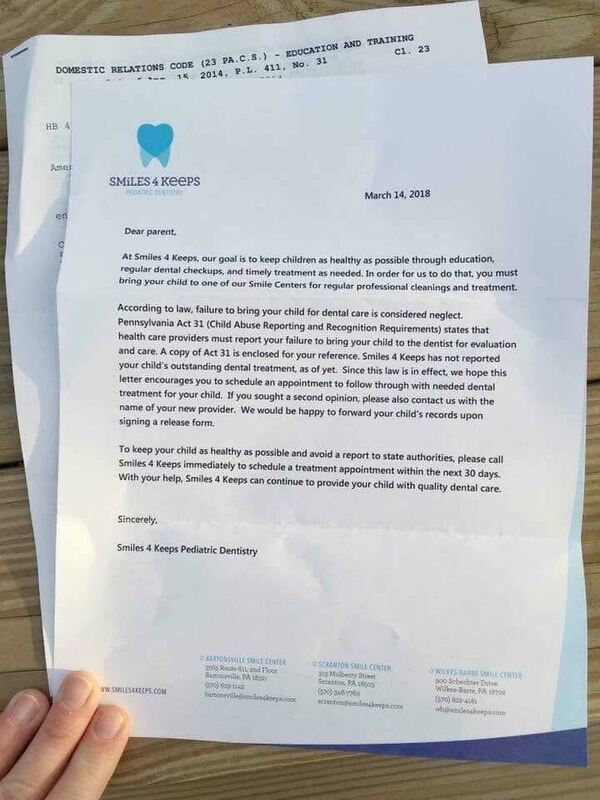 A dentist in Pennsylvania actually sent this letter to some of his patients. A child abuse investigation sometimes is a necessary act. But at other times, it can do great harm to children. At a minimum, government investigators with the power to have children removed on the spot will question the children about the most intimate aspects of their lives, often stripsearch those children and leave the entire family terrified of what might happen if those government agents come back again. The younger the child the greater the extent to which the investigation becomes, in itself, an act of emotional abuse. A recent study estimates that about one-third of all American children, and a majority of African American children, will be subjected to this trauma at some point in their childhoods. And more than 80 percent of the reports turn out to be false. Even if the report ultimately is labeled false, it often is retained in child welfare agency files and can be used against that family if they are victimized by another false report on the theory that, by some magic, enough false reports equal a true report. The consequences go beyond the harm to children victimized by false reports. 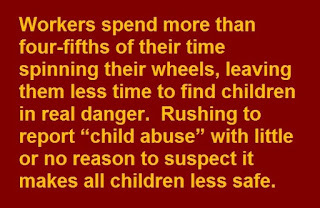 Workers spend more than four-fifths of their time spinning their wheels, leaving them less time to find children in real danger. 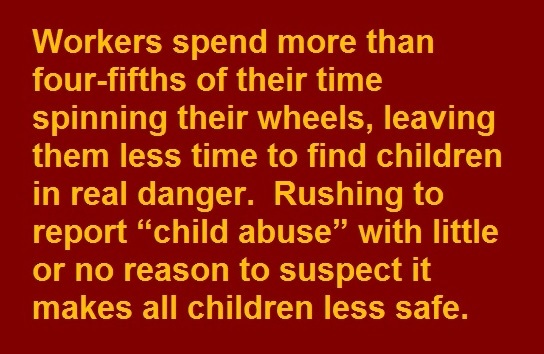 Rushing to report “child abuse” with little or no reason to suspect it makes all children less safe. So it is an act of willful ignorance for those who defend needlessly inflicting this intrusion on families and needlessly overloading the system to claim that no harm is done as long as the investigator concludes the allegation is false. ● They do not allow parents to stay with their children during dental procedures. ● The parent never even meets the dentist, only the hygienist. ● They claimed her children had seven cavities between them – but she says, they never showed her the x-rays. ● They will treat only one child for fillings per day. If the parent has more than one child in need of procedures, they have to make a separate appointment. Having to take two days off from work for two separate follow-up appointments was the last straw. So Hoyumpa exercised her right not to return to Smiles 4 Keeps. She told the receptionist she would be seeking dental care elsewhere. And she made her displeasure loud and clear. “At Smiles 4 Keeps our goal is to keep children as healthy as possible through education, regular dental checkups and timely treatment as needed. In order to do that, you must bring your child to one of our Smile Centers for regular professional cleanings and treatment. If you sought a second opinion, please also contact us with the name of your new provider. We would be happy to forward your child’s records upon signing a release form. 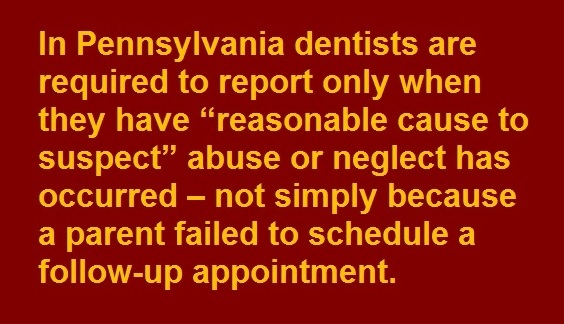 I think it's used as a scare tactic actually, to scare parents to bring their kids to those offices … I'm shocked that it's a Pennsylvania group of dentists who've resorted to something like this. Neither Hoyumpa nor any other consumer has any obligation to communicate with Smiles 4 Keeps or to set foot in its offices if she doesn't want to, and she is not required to tell them why or where they've gone instead. Yet [Smiles 4 Keeps founder Dr. Ross] Wezmar and his offices are threatening families with government investigations for declining to do business with him. … Does he even care that he could upend families' lives by reporting them to the state? … Citing this law to try to scare parents into patronizing your business is pretty damned low. The letter from Smiles 4 Keeps also is inaccurate. 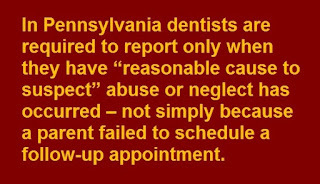 And while it is true that dentists in Pennsylvania, as in most states, are required to report child abuse, in Pennsylvania they are required to report only when they have “reasonable cause to suspect” such abuse or neglect has occurred – not simply because a parent failed to schedule a follow-up appointment. As for “Act 31” – which Smiles 4 Keeps enclosed with the letter, that’s just a long, turgid section of state law concerning training requirements for mandated reporters. It says nothing about what must be reported. In a follow up story, Wezmar, the founder of Smiles 4 Keeps, not only defends the letter, he brags about running the first dental practice in all of America to send such threats to patients. He makes the usual argument: Horror stories. Wezmar supplied the television station with photos of severely diseased teeth – though it is never said if these are photos of actual Smiles 4 Keeps patients or simply something from a textbook. And he claims the threat letters were sent to only 17 patients last year. The fact that she objected so loudly to the practice’s practices also may have contributed to getting Hoyumpa on the Smiles 4 Keeps threat letter list. willful failure of parent or guardian, despite adequate access to care, to seek and follow through with treatment necessary to ensure a level of oral health essential for adequate function and freedom from pain and infection. But no evidence has been offered indicating that Hoyumpa’s case fits that definition. Smiles 4 Keeps claims that it makes lots of phone calls and emails to patients urging them to make follow up appointments before sending the threat letters. (Hoyumpa says, however, she received no such warnings). And I know of no public statement from the practice about offering the kinds of help described by the Academy. Right. Because what could be better for a child than to face the trauma of a child abuse investigation because the family chose to find another dentist? And what could be better for children than bothering child protective services agencies with more false and trivial reports, stealing the time of caseworkers from finding children in real danger? There have been suggestions that Hoyumpa complain to state consumer protection authorities. That’s not likely to do any good. Mandatory reporting laws make it easy for professionals who work with children to abuse their power. There is no penalty for false reports made in good faith – and good luck proving that a medical professional wasn’t acting in good faith. Indeed, Wezmar and his colleagues may well have persuaded themselves that they are doing the right thing by sending these letters – rationalization is powerful. But false reports by medical professionals, even when well-meaning, are among the most dangerous, since they are among the reports most likely to be “screened in” for investigation by child protective services hotlines. All this in spite of the fact that, even after more than 50 years, there is not a shred of evidence that mandatory reporting laws actually make children safer. Many former proponents of those laws have had second thoughts. And the climate is especially ugly in Pennsylvania, where hype and hysteria over child abuse have been at a fever pitch for years, largely as a result of the scandal involving former Penn State coach – and former group home operator and foster parent – Jerry Sandusky. The Pennsylvania Legislature responded to that scandal with 23 separate laws broadening definitions of child abuse and generally encouraging anyone and everyone to report anything and everything. It’s unlikely that any consumer protection agency is going to want to look “soft on child abuse” by helping families fight back. Even beyond the trauma of the investigation, the consequences for the children of the falsely accused can be severe. But in child welfare, a lot of people are just blowing smoke. The child protective agency says it hangs onto files for “accountability.” But if the charges were found meritless, it makes no more sense to keep Melissa’s case on file than it would if she were investigated for bank robbery and found to have been six states away the night of the crime. Should the authorities keep a file on her just because they once, completely mistakenly, thought she robbed a bank? The issue here is how easy it is to drag a family into an abuse investigation, and how hard it is for the family, like an impacted molar, to get itself extracted. Still, it could have been worse. At least this happened in eastern Pennsylvania. Everything would have been worse had it happened at the other end of the state – in Pittsburgh. This post explains why.